Floaters (dark spots) are a very common phenomenon. 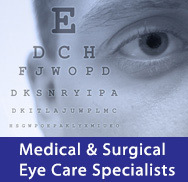 Most of the time they are harmless signs of aging eyes but sometimes they can indicate a more serious eye problem. These spots are often a sign of vitreous detachment. The vitreous is a gelatinous fluid inside our eyes that helps to nourish the cornea and lens and can develop small particles as we age. Floaters can appear as dots, cobwebs, strands, or other shapes. Floaters are more common as we age, after eye injury or surgery, and in near-sighted people. The appearance of new floaters, especially when associated with flashes or visual distortion and blurring, requires a dilated eye exam to evaluate the retina. In some cases the floaters can indicate a retinal tear or detachment. We offer an outpatient laser procedure to treat these tears when small and identified early.